I was recently put in touch with Mr Jim Ashby, one of Sealink's managers, who occasionally worked at Newhaven. He has a collection of British Rail and Sealink photos and has said that he'll look out some that are relevant to Newhaven. Here are three showing member's of Meeching's crew in the early 1970s. 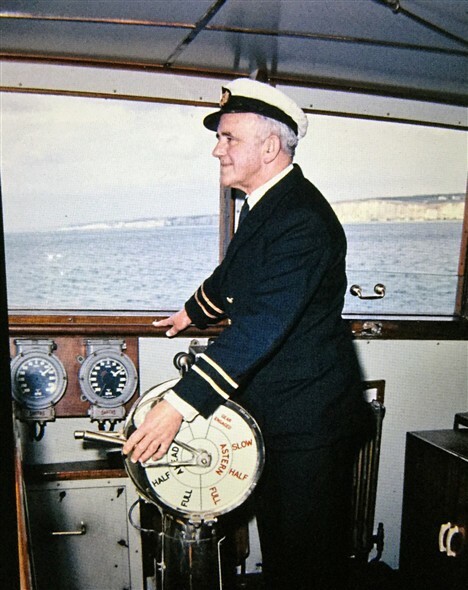 First up, at the Bloctube engine telegraph controls in the wheelhouse, is skipper Alex Pringle. This would be just prior to his retirement from the tug and his move shoreside to work in the port offices for a few years. Eagle eyes will spot that although the propshaft revs shown on the dials are the same, the telegraph handles are in different positions. This 'fault' was present from day one and when I visited Nore Crest, as Meeching is now, it still hadn't been fixed, 55 years on! 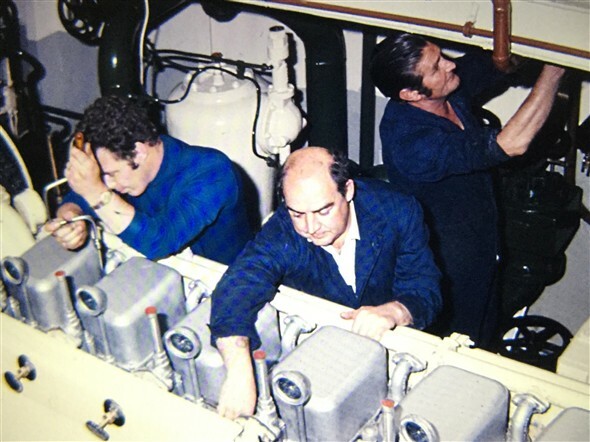 Next it's down below to the engine room, where we see Chief Engineer Bob Patterson, 2nd Engineer Bob Stonehouse and greaser Bert Richardson hard at work on the Starboard Lister-Blackstone engine. Note the spotless condition of the engine room! Here we see two of the tug's ABs on the foredeck, apparently being shown how to paint by the tug's Mate! One of the two looks like Graham Ware. Now here's a question. Sally Flowers was the tug's Mate at the time, but the man in the photo doesn't look like Sally. Right hair colour, right one-ring uniform and peaked cap, but no trademark beard! Maybe someone standing in for Sally while he was on leave? 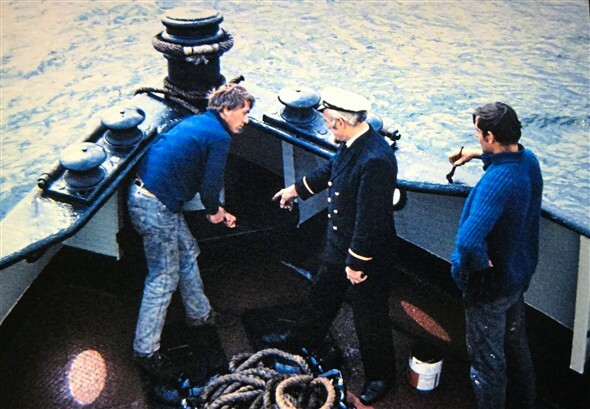 Joking aside, Meeching's crews always took great pride in her and when the tug wasn't busy or the weather was too bad for dredging, her two Skippers would often have the crew chipping, painting and tidying. I'm guessing that all these photos were posed for publication in the 'in house' magazines, either Rail News or Sealink News, but I can't recall ever seeing them in print. This page was added by Andy Gilbert on 27/10/2017.